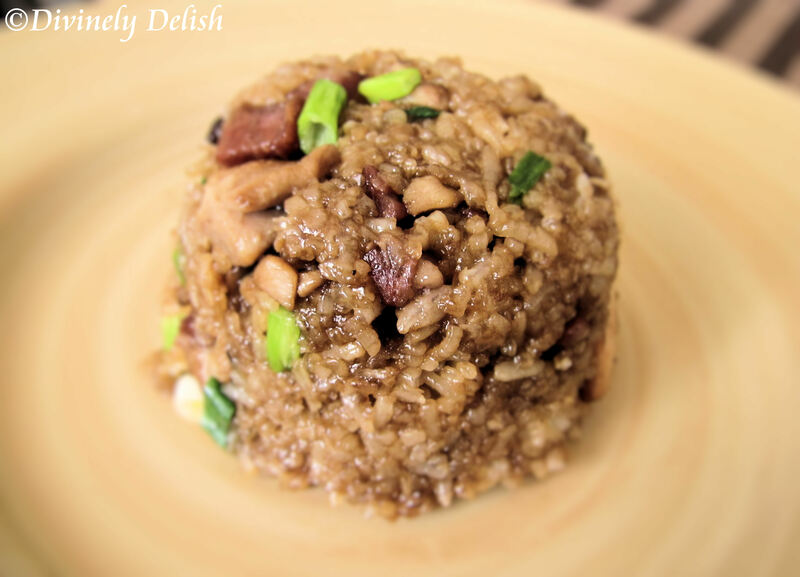 Glutinous rice – also known as sticky rice or sweet rice – is a type of rice which has opaque grains and a very sticky (rather glue-like) consistency when cooked. It is used in both sweet and savoury dishes throughout East and Southeast Asia. 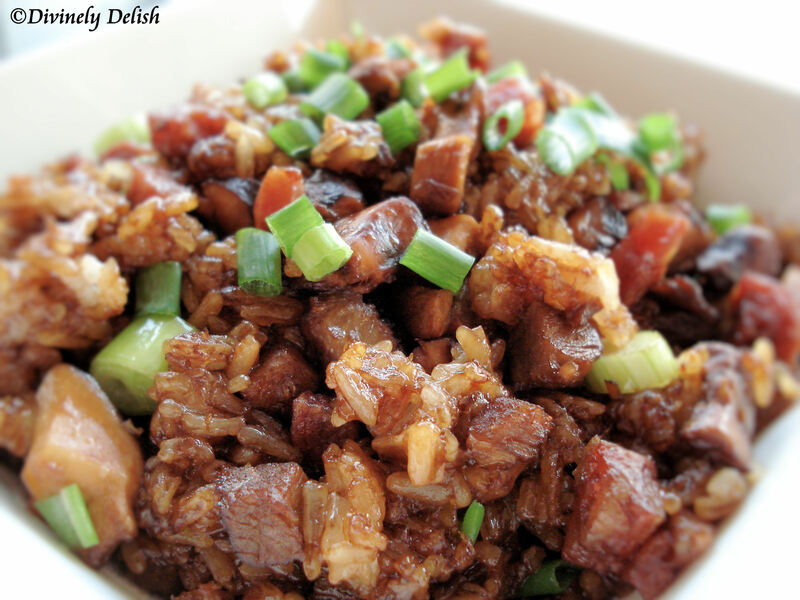 Stir-fried glutinous rice is a popular Chinese restaurant dim sum item that is usually served wrapped in lotus leaves. As a kid, whenever I went for dim sum, I always enjoyed this dish the most. It would come in an individual-sized bowl, which I would turn upside down onto a plate before digging into the little dome of delicious sticky rice. Even now, this is still one of my favourite dim sum dishes. Cooking this the traditional way is time-consuming, as it involves having to alternate between stirring the uncooked rice over medium heat, adding a little bit of water, and continuing this process until the rice is thoroughly cooked. If you don’t have the patience for this, you can cheat a little by first steaming (or letting the rice cook in a pot or rice cooker) and then frying it with the rest of the ingredients. Here’s a recipe that will save you time without sacrificing taste. 1) Place the rice in a large bowl, cover with cold water and wash 5 times or until the water becomes clear. 2) Place the water and the rice in a cake pan into a steamer. Cover and steam for 35 minutes. Turn off heat, remove the pan and set aside. 3) Heat a dry wok over high heat. Add the bacon and stir fry for 30 seconds. Push to one side and add the sausage. Stir fry for 1 minute, then combine with the bacon. 4) Add the BBQ pork, shrimp and mushrooms and stir fry for 20 seconds. 5) Add the salt and stir fry for 15 seconds. 6) Add the reserved rice, reduce heat to medium and constantly stir fry until well mixed. 7) Add the soy sauces and oyster sauce and stir fry until the sauces have mixed into the rice. 8) Add the green onions and sesame oil. Turn off heat and mix well. 9) To serve, pack the rice into small rice bowls and then turn over onto plate to create smooth rounds.